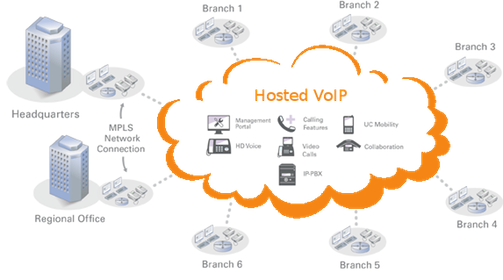 A form of business VoIP services where the VoIP provider hosts the VoIP equipment, servers and services. The VoIP provider manages the calls and routes them to and from the subscriber’s existing telephony system and equipment. Hosted VoIP is also frequently referred to as managed VoIP and can save companies from the potentially expensive costs of having to invest in VoIP equipment and manage the system. As with all VoIP solutions, hosted VoIP services use packet-switched telephony to transmit calls over the Internet as opposed to the circuit-switched telephony used by the traditional Public Switched Telephone Network (PSTN), although in some hosted VoIP cases calls from the subscriber are routed over the PSTN to the hosted VoIP PBX system. When implemented appropriately Hosted VoIP can provide small to medium sized businesses with enterprise level features at a price point they can afford. No need to purchase VoIP hardware or software for lower initial capital expenditures. Greater adaptability that allows features to be added and changes to be made in order to accommodate the fluctuating needs of a growing business. Easy to increase and decrease capacity in accordance with seasonal peaks and economic swings. Troubleshooting is conducted remotely, eliminating the lengthy wait time typically involved in service calls. By not involving the participation of a company’s internal staff, providers can deliver a faster and more reliable deployment schedule. Integrates seamlessly with most legacy systems, allowing for an easy migration from traditional telephony to VoIP. Round-the-clock monitoring ensures ongoing peak performance. Per-seat licenses mean companies only pay for the technology they’re using. Recurring fees mean the total cost of ownership may be higher over the course of several years. System improvements and upgrades may take longer to execute than if the equipment were based internally. There is always the possibility that a vendor may go under or consolidate with a competitor. © 2012 NetFarm Inc. All Rights Reserved.